Portsmouth captain Michael Doyle admits the team need to take "a look at themselves" to get their League Two promotion push back on track. 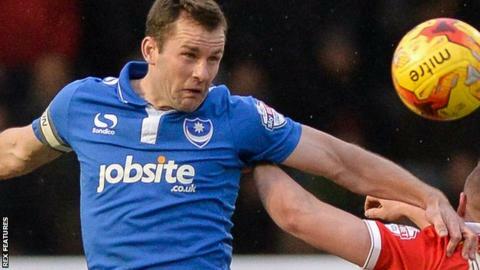 Pompey slipped to seventh in the table after losing 1-0 at home to Leyton Orient on Saturday. The defeat means Paul Cook's side have taken just one point from their past three league games. "The defeat was bad enough, but the performance overall was flat from us as players," Doyle told BBC Radio Solent. "The first thing I will be doing is going away and looking at myself. "I think every player should be doing that now," the 34-year-old former Sheffield United midfielder added. "We're going to have to dig deep and find what we need to find to give the right response next week." On Saturday, Portsmouth host fellow promotion-chasers Bristol Rovers, who are just two points above them in fourth.